Breakfast with a slice of toasted or baked bread topped with butter or jam is perhaps the staple morning food for many. However, if your kitty comes, looking greedily at your wholesome meal, you may be in two minds regarding how safe bread is for it. The good news is that a little bit of baked or toasted bread when eaten in moderation would be okay for your cat. Though it is a matter of personal choice and preference, most cats have a strong liking towards bread, enjoying a slice of it alongside other bakery goods like pizza, muffins, cake or even breadcrumbs. One of the reasons for this is that most varieties of bread contain yeast as its ingredients, the flavor of which attracts kitties a lot. In fact, it may perhaps be for this reason that yeast is a major component in adding flavor to cat foods, treats, as medications. Similar to cheese, bread is also used for rolling pills or medicines and feeding cats who are stubborn enough to take it. However, if your cat already has an underlying medical condition like a heart or kidney ailment, feeding it bread can add to its plight as the latter contains salt, which can aggravate these conditions. Apart from being used as bait to feed medicines to the stubborn ones, it would not give much nutrition to your cat. Moreover, they contain complex carbohydrates, which in turn might trigger obesity if consumed continuously. If your cat already has a sensitive stomach, then having bread would add to its misery. A better option would be to feed it lean protein treats which would satisfy its taste buds as well as give it the required nutrition. White/ brown bread: Yes, in small amounts. However, the sliced ones purchased from stores are high in salt and sugar, so its consumption must be limited. Wheat/wholemeal bread: Okay, when consumed in moderate quantities. Bread dough: No, as it would rise in your kitty’s stomach, resulting in abdominal pain and even coma or death in extreme cases. Savory bread: No, since it contains raisins, onions, garlic or other additives, which may affect your cat’s health adversely. Milk and bread: No, not a right combination to give your cats since most of them suffer from lactose intolerance. Bread with spreads: No, as dips like cheese or sauces as well as spreads like jam, jelly or butter or peanut butter since they are high in calories and the felines might also have trouble digesting them. Breadsticks: Better to avoid since it contains ingredients like yeast, salt and artificial seasonings which are not healthy enough for cats. Pita bread: Only a small morsel, that too rarely. Cinnamon bread: Though cinnamon is not toxic for cats, give it only as an occasional treat. Pumpkin bread: Better to avoid since pumpkin is nontoxic but has chances of hurting the cat’s stomach as it is rich in fiber. Zucchini bread: It will not hurt the cat but should be consumed in small quantities. Potato bread: In moderate amounts. Bread rolls: No, as it has several spices for stuffing. 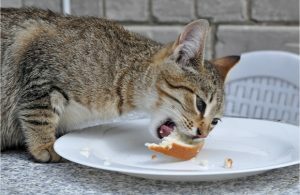 If your cat reacts differently or experiences uneasiness after eating bread, be quick to get in touch with a veterinarian.